I have been working on some new social pragmatic cards. I found that most of my social pragmatic cards did not have answers included. I needed cards that students could use in small group activities and would have an answer they could discuss if an adult wasn’t with their group to get them thinking. I also wanted to use them for role playing. I found that students really enjoyed video taping themselves and viewing themselves. However a written prompt was needed for some students. Students will be told that the answer is a possible answer and there may be more than one possible answer in some cases. These cards were made for my students in 3rd through 6th grade. I tried to include some more difficult scenarios that would be beyond the school environment. Some of my older students need to spread their wings a bit more. I included 12 cards for download here and under Social Language. There are 20 more at the TPT store. Today we continued to work with the social pragmatic group using the Superflex program. The lesson of the day required the use of a flexible brain to illustrate how the brain needs to be flexible to grow and handle changes in its environment. There is a comparison of a rigid brain with a flexible brain. For those who do not know the program, Superflex conquers Rock Brain who is not flexible and doesn’t adapt to change well. He keeps getting stuck doing the same old thing. 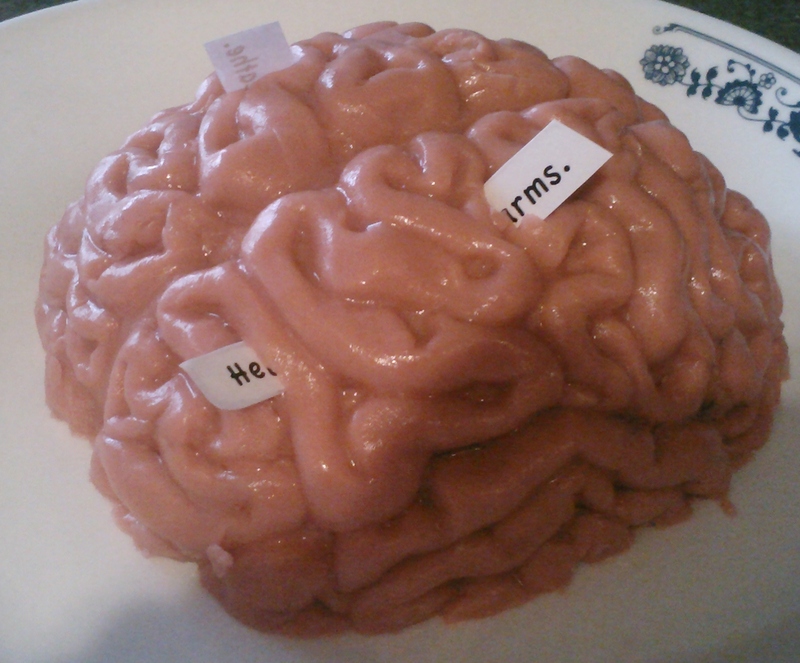 The lesson manual suggested using a brain mold to make a jello brain. I was in luck because I knew someone who I could get the mold from. The manual did not give actual directions or a recipe. I put this lesson off for as long as I could because I do not have a good history with jello molds. I have a history of jello that sticks to the mold and never turns out looking right. The thought of trying to work with one in the time line of classes had me worried. I figured the jello would melt and be over the table before the session was up. I researched jello brain recipes on the internet. It turns out that there are a lot of these. Some of them are a bit on the gross side of things. I decided to stay away from the worm and bug infested brains although I’m sure they would be attention grabbing. I wanted something that would be close to flesh tone and stay fairly solid. So I settled for the following recipe. Dissolve the gelatin in the boiling water, Spray the inside of the mold with vegetable o spray. Add milk and cold water to the gelatin mixture and stir until smooth. Add 2 drops green food coloring. The mixture should look more flesh-colored. Add a drop at a time until you get the right color. Pour the mixture into the mold and put in the refrigerator. This brain turned out to be quite solid and kept its form several hours. For the lesson, slips of paper with brain functions from the categories of social awareness, motor,and factual/science are inserted into the jello brain. The students take turns pulling these out and talking about them. I debated the best method of getting the papers in the jello. I ended up laminating the papers and poking them in after the brain was taken out of the mold. This way ends of the paper were left sticking out and easy to grab with tweezers. Surprisingly, the brain is still in good shape after the papers are removed and I can use it again for another group. No one asked if they could eat it. I took a picture of the brain so you could have a visual.